Trump Broke Up Families to Deter Illegal Immigration. New Numbers Show That Plan Has Failed. The number of families apprehended at the border has stayed flat. The Trump administration boasted on Thursday of a drop in illegal border crossings last month, crediting the administration’s “zero tolerance” immigration policy that caused more than 2,000 children to be separated from their parents. That policy, some top-level administration officials have claimed, was carried out in order to deter additional families from coming to the country illegally. “Following the implementation of the administration’s zero-tolerance policy, the June 2018 Southwest Border Migration numbers declined by 18 percent when compared to the previous month,” the Department of Homeland Security announced in a statement on Thursday. But there are two major problems with the claim that “zero tolerance” was reducing illegal immigration. First, the number of families being apprehended at the border—the people who would actually be deterred by the policy—stayed flat. From May to June, that number went from 9,485 to 9,449, a statistically meaningless 0.38 percent drop. And second, the 18 percent drop in overall apprehensions is hardly unusual. 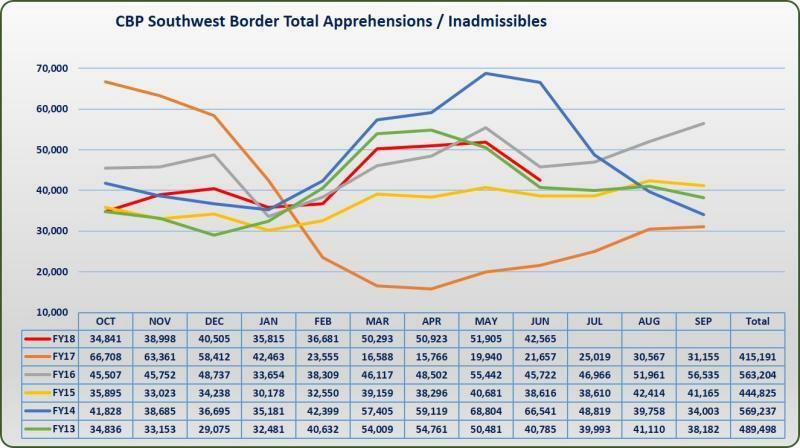 DHS’s attempt to attribute it to the president’s controversial immigration push appears to ignore the agency’s own statement, which links to US Customs and Border Protection numbers showing that there’s a decline in apprehensions nearly every year around this time. In fact, an equal 18 percent drop was recorded in 2016 under the Obama administration. Also on Thursday, Health and Human Services Secretary Alex Azar revealed that more than 2,000 children—and possibly as many as 3,000—who were separated from their parents under the policy have yet to be reunited with their families. Azar on Thursday was unable to provide an exact figure.